(CNN) -- Lindsey Vonn made a dream start to the alpine skiing world championships in Val d'Isere with victory in a testing super-G -- the opening event at the French resort. Vonn claims the first of what she hopes will be five medals in Val d'Isere. Vonn, winner of the previous two World Cup races, including a super-G at Garmisch on Sunday, recorded a time of one minute 20.73 seconds. France's Marie Marchand Arvier took a surprise second, 0.34 seconds back, with Andrea Fischbacher of Austria in the final medal position. Vonn, who leads the overall World Cup standings, is set for a big medal haul at the 12-day championships with strong chances in the other disciplines of slalom, giant slalom, downhill and combined. 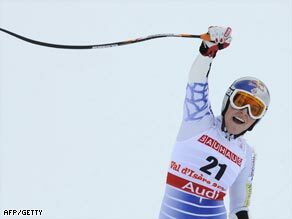 Her arch-rival, Maria Riesch of Germany, finished a distant eighth, a full 1.71 seconds adrift of Vonn while two-time defending champion Anja Paerson of Sweden missed a gate early on the Rhones-Alpes course and skied out. Vonn, who had never previously won gold at a world championships or Olympics, was adrift of early starter Marchand Arvier and Fischbacher on a treacherous upper section, but made up ground on the lower slopes. "It's amazing, there were very difficult conditions out here today, " she told Eurosport. "I'm so happy, it was more difficult than expected, the light was getting darker and darker for the later starters," she added. Marchand Arvier was delighted to give the hosts their first medal in the first event. "For me a medal is great, it's magic, Vonn skied better at some key points," she said. The championships continue on Wednesday with a men's super-G.